(Nanowerk News) Superconductivity is a rare physical state in which matter is able to conduct electricity--maintain a flow of electrons--without any resistance. It can only be found in certain materials, and even then it can only be achieved under controlled conditions of low temperatures and high pressures. New research from a team including Carnegie's Elissaios Stavrou, Xiao-Jia Chen, and Alexander Goncharov hones in on the structural changes underlying superconductivity in iron arsenide compounds--those containing iron and arsenic. It is published by Scientific Reports. Although superconductivity has many practical applications for electronics (including scientific research instruments), medical engineering (MRI and NMR machines), and potential future applications including high-performance power transmission and storage, and very fast train travel, the difficulty of creating superconducting materials prevents it from being used to its full potential. As such, any newly discovered superconducting ability is of great interest to scientists and engineers. Iron arsenides are relatively recently discovered superconductors. The nature of superconductivity in these particular materials remains a challenge for modern solid state physics. If the complex links between superconductivity, structure, and magnetism in these materials are unlocked, then iron arsenides could potentially be used to reveal superconductivity at much higher temperatures than previously seen, which would vastly increase the ease of practical applications for superconductivity. 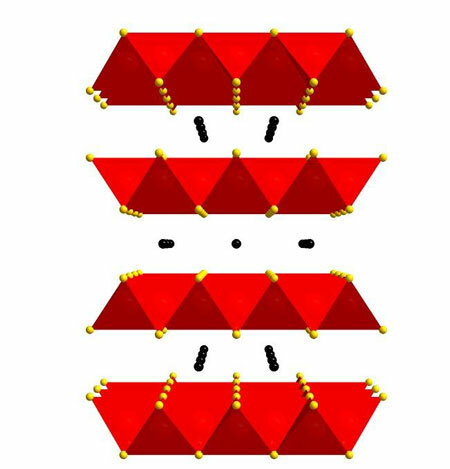 When iron arsenide is combined with a metal--such as in the sodium-containing NaFe2As2 compound studied here--it was known that the ensuing compound is crystallized in a tetrahedral structure. But until now, a detailed structure of the atomic positions involved and how they change under pressure had not been determined. The layering of arsenic and iron (As-Fe-As) in this structure is believed to be key to the compound's superconductivity. However, under pressure, this structure is thought to be partially misshapen into a so-called collapsed tetragonal lattice, which is no longer capable of superconducting, or has diminished superconducting ability. The team used experimental evidence and modeling under pressure to actually demonstrate these previously theorized structural changes--tetragonal to collapsed tetragonal--on the atomic level. This is just the first step toward definitively determining the link between structure and superconductivity, which could potentially make higher-temperature superconductivity a real possibility. They showed that at about 40,000 times normal atmospheric pressure (4 gigapascals), NaFe2As2 takes on the collapsed tetragonal structure. This changes the angles in the arsenic-iron-arsenic layers and is coincident with the loss in superconductivity. Moreover, they found that this transition is accompanied by a major change in bonding coordination in the formation of the interlayer arsenic-arsenic bonds. A direct consequence of this new coordination is that the system loses its two-dimensionality, and with it, superconductivity. "Our findings are an important step in identifying the hypothesized connection between structure and superconductivity in iron-containing compounds," Goncharov said. "Understanding the loss of superconductivity on an atomic level could enhance our ease of manufacturing such compounds for practical applications, as well as improving our understanding of condensed matter physics."